Now: Executive Chef at the renowned Golden Door in Escondido, Ca. Kayla is the first woman in this position for nearly twenty years and the youngest ever at a tender 25 years of age. Then: After graduation, Kayla worked with her family to open an upscale bed and breakfast in a renovated 1790 farmhouse in New Paltz, New York. She loved creating their three-course gourmet breakfast menus – one particular guest-pleaser was her Black-bottom Lemon Pancakes. She also served as sous-chef at the Postage Inn in Tillson, NY. 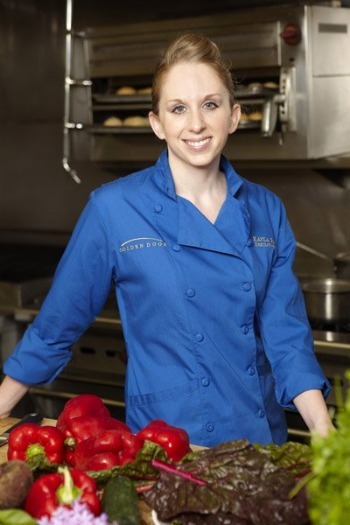 In July 2007 Kayla join the culinary team at Golden Door as a line cook. The following year she became Sous-Chef to Executive Chef Dean Rucker. Then last April, she took over the golden ladle position of Executive Chef, when Tucker left to pursue other opportunities. Bragging rights: Received merit based scholarship offers from both Johnson and Wales University and the California School of Culinary Arts. Cooking Education: Graduated from the Culinary Institute of America, Hyde Park, where she received a Cream of the Crop Scholarship. Kudos: Golden Door Spa guests drool over Kayla’s creations. She puts delicious into nutritious eating. William Anton, Chairman Emeritus of the Board of Trustees of the Culinary Institute of America had this to say about Kayla’s cooking, “Thursday night I had the BEST quail I’ve ever had in my life–which is quite a statement given my life’s work in the Hospitality Industry”. My first professional job was at the age of 16, when I was hired to cook dinner for the 29 nuns living in the convent at my Catholic High School in California. The Irish nuns were happy with simple meat and potatoes every night but I loved sneaking in some new foods for them to try. Did you ever consider another career? Never. Well, actually, I really love baking and had thought about going the pastry route but felt a general cooking background would be more useful. I still bake quite a bit and love to decorate cakes. Deborah Szekely (now in her late 80’s) is still involved in all parts of the operation at the Golden Door, including the kitchen, and she is my inspiration. She was quite young when she founded the Golden Door so we have that in common. She’s taught me a lot about attitude, patience and managing others. Seeing how much she has accomplished throughout her life makes her a wonderful role model. How does your food compare to Chef Dean Rucker’s? Dean is a great chef but I would describe his food as “healthy fine-dining cuisine”. I’m more interested in cooking casual comfort food. I really enjoy developing healthier versions of my childhood favorites. I just turned 25 (another infectious giggle) so I’m just very, very happy to be here now, doing what I’m doing. Any tips for cooking healthier food at home? There are a couple of really useful tools that I use quite a bit. One is a microplane that I use for for zesting citrus fruit and it’s also great for shredding cheese. It makes mounds of light, fluffy strands. I recommend lining cookie and baking sheets with sheets of non-stick silpat so you don’t have to grease them. I always have spray bottles filled with grapeseed oil (it’s healthier and has a higher burning point so it’s easy to quickly sear food and seal in the flavors) and just use a spritz or two on the bottom of the pan. If you have a favorite salad dressing recipe, try replacing most of the oil with water. You can make low-fat tortilla chips by spritzing thin white corn tortillas with a little grapeseed oil and then bake at 350 degrees for about 5 minutes. Any suggestions for getting my family to eat more veggies? I love cooking with different grains such as quinoa and wheatberries. It’s easy to fluff them by adding different veggies. I add about 9 cups of vegetables to 1 cup of grain or rice and get ten servings out of it. Or take hummus (homemade or store-bought) and try jazzing it up with chipotle chilies, roasted tomatoes and red or green peppers. *In blender, combine anchovies, buttermilk, cottage cheese, garlic, lemon juice, Worcestershire sauce, black pepper, and chili sauce. Process until consistency is smooth and creamy. *Pulse in parsley and shallots. Do not overblend or dressing will be green. 1. Preheat the oven to 375 degrees. Line a baking sheet with parchment or wax paper, spray with vegetable oil spray, and set aside. 2. Brush the whole wheat tortillas with the lightly beaten egg white and cut each tortilla into 12 equal size chips. In a small cup, combine the cinnamon and sugar and mix well. Place the tortilla chips on the prepared baking sheet and sprinkle with the cinnamon-sugar mixture. Bake the tortilla chips for 10 minutes or until golden brown and crisp. Remove from the oven and let cool. The Golden Door in Escondido, California, hosts a maximum of 40 guests per week. Sessions run Sunday through Sunday and include individually designed exercise programs, daily massage, beauty consultations, and meals. For more information visit the website at goldendoor.com or phone 800/424-0777.